The PYRO control systems offer driveways, walkways, paths, stairs, roof & gutter de-icing solution that prevent the formation of snow and ice for industrial, commercial and residential installation. The controllers can be installed both with Hydronic and electrical heating systems. The unique staggering feature of the PYRO control allows the home or property owner to melt snow and ice in larger surfaces and areas than by using common de-icing/snow melting system with the available power supply on site. The modularity of the PYRO system makes it the most suitable solution to any installation as the customer can choose the right configuration for his property needs. A special attention was addressed making the system simple for use both by the installer and the end user. A quick installation accompanied with minimum wires connections makes the system "full error resistance"
PYRO_X - A full snow melting and de-icing system from the sensor to the power box. 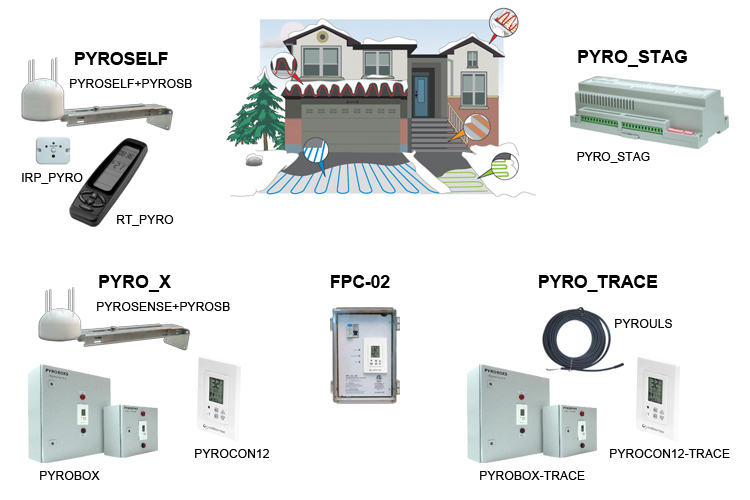 PYRO-KIT - The control system alone, while the installer takes care of the power box and wires connections. PYROSELF - A stand-alone simple Snow sensor and controller with remote control. FPC-02 - Freeze protection controller and power panel for heat tracingand freeze protection applications. PYROTRACE - Heat Tracing controller for pipe and gutter application. PYROSTAG - A staggering controller to be added on any existing snow melting system (PYRO_STAG). The ultimate controller for industrial, commercial and residential. Freeze protection controller and a power panel for heat tracing and freeze protection applications.